Amenities – All residents of StrawBerry Ridge and their guests have the luxury of being able to take advantage of a wide range of community amenities, including two swimming pools (one indoor, one outdoor), exercise facilities, tennis courts, pickleball courts, shuffleboard courts, a woodworking shop, a billiards room, and a Bingo hall – just to name a few. Affordably priced housing – The homes that line the streets of our community near Tampa, FL, are all low maintenance, affordably priced structures designed to accommodate the lifestyle goals and budgetary constraints of retirees. Several of our homes have recently been upgraded with new drywall, solid wood kitchen cabinets, energy efficient appliances, new windows, new vinyl siding, and other attractive features. Community lifestyle – Being a resident of StrawBerry Ridge means being part of one of the most vibrant 55 communities in the state. In fact, at StrawBerry Ridge, there is just about always something to do and friendly neighbors to do it with. 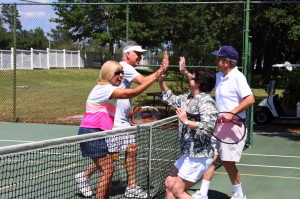 Our residents frequently partake in a variety of activities and social gatherings, which isn’t always the case at other 55 communities in Florida. If you’d like to plan a visit to StrawBerry and request more information on why we are one of the top 55 communities in the Tampa, FL, area, contact us today.